I picked up an old Trek 420 road bike from the Bike Shop recently with the goal of turning it into a better commuter than the one I’ve been using. My old commuter is just an old mountain bike with some lights, reflective tape, and a horn. Not especially fast on the road. I did a post about it earlier this summer. Like I said, it’s not fast. I use it because I have it, and that’s pretty much about it. 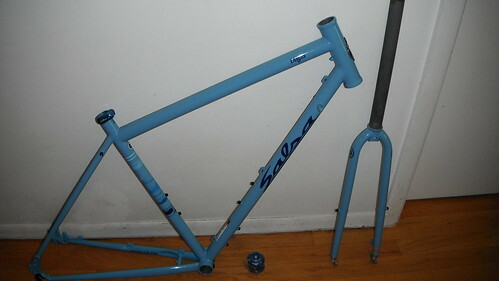 My goal with the Trek is to turn it into a simple, reliable commuter with fenders, a rack, and a new life. For the first week of bike month, I was able to commute every day of the week, totaling about 35mi. Weight 178.2, BF 12.3% (I was apparently dehydrated when I stepped on the scale). Not a huge amount, but I do have a short commute. I compiled a video showing one of my route options (the one with some dirt). Week 1 Bike Month from TheGPSGeek on Vimeo. 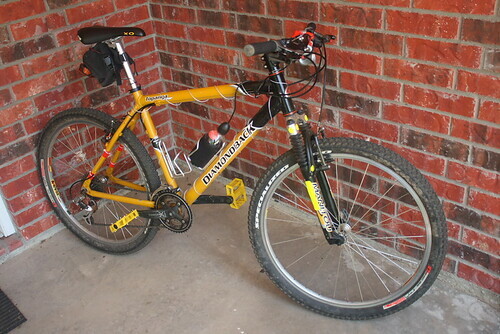 Here’s my main commuter: It’s a 2000 Diamondback Topanga Comp.